Today was an extremely long one. It’s now 9:34pm, and it started at 6am. I know, to most of you that’s really not a big deal. Perhaps not on a normal day, for a normal person. But, today wasn’t, and I’m not, so I’m told. It was important for me to get up before 7am in order to be alert before Sarah got here to make pancakes for Ruth and me. Of course I told her it wasn’t necessary, but I really didn’t try very hard to dissuade her. Sarah, as some of you may know, is Larry’s daughter, therefore Ruth and Lyle’s granddaughter. She’s an emergency room nurse at the Hartford hospital where Lyle finally saw the light. Sarah showed up right on time and went about making the pancakes as promised. She did, however, make me cook my own eggs, which was just fine with me. Actually, she would have cooked those, too, but I thought getting pancakes was great, and going for eggs, too, was pushing the limit a little. After I started the eggs, Ruth decided she’d like some, too, but she wanted hers scrambled. So, I scrambled the eggs I was cooking and gave them to her. Since they were the last two in the refrigerator, upstairs, I had to trek to the basement where they keep all the replacement food. Then I cooked my eggs. As you know I usually take pictures of things I eat but this time I didn’t. I’m sorry. It was a very good breakfast so Sarah got both Ruth and me off to a great start. And it was a good thing, too. First up was returning to the funeral home where we once again assumed our seats while those who wished to participate in the procession to the church filed in and took a seat. Lyle was still there in the background quietly taking in all the goings on. As people arrived, they signed in. When everyone was there, the funeral crew started calling out names. As each one was called, they stopped and kneeled by Lyle, on the handy kneeling platform provided, paid their last respects to him, then exited to their vehicle which was already adorned with a little magnetic flag that was imprinted with “Funeral”. It was purple. I remember that. Alas, the family was last to leave. Prior to departing, however, I stretched the boundaries of funeral protocol by taking a few dozen photos. I will save those for a more private viewing, because I took pictures of everything. Finally we were released to enter our vehicle. We had Ruth’s Toyota Highlander, and we were vehicle number one. A Funeral Traffic Director lined up the vehicles in two rows at the parking lot exit and urged us to wait for the hearse to pass before we took off. We did, and the hearse, preceded by a van with a nifty blinking blue light on top, finally went around us and the procession was started. Larry was driving with Ruth up front, Valerie and me in the back.Valerie is Larry’s wife. It doesn’t take very long to get places in Connecticut so it was a relatively short trip. The hearse, and the pace van, led us to the front of the church where we parked in the wrong lane, against the curb, on a narrow street. No one in the oncoming lanes blew their horns, or anything, so I guess they’re used to this around here. We debarked our ride and waited in front of the church while the pall bearers helped Lyle out of the hearse and walked him up the stairs to the coffin holder on wheels. They rolled it into the church a little ways, Ruth and me right behind, then stopped until Father O’Grady came back to bless the casket. Then it was covered with a nice table cloth and pushed to the front of the church. Ruth and I had to hurry to keep up, but we made it. The family filled the first two or three pews on the right side of the church, then the ceremony began. I had an aisle seat, right behind Ruth, next to Sarah, and two other granddaughters, Laura, Heather. First, Susan, one of Lyle’s and Ruth’s granddaughters, sang. Did I tell you that she sings like an angel? Well, she does. I would have taped it but wasn’t allowed to bring my camera into the church. That’s not true. I just gave it a little thought and decided it wouldn’t be appropriate, so left it in the car under my hat. Susan sang many songs during the service and it was absolutely beautiful. Lyle was 19 when I was born, and well on his way in life. Consequently, my childhood memories of him are sparse. I learned about Lyle through pictures, stories, and infrequent visits to Oregon throughout the years. One childhood picture continues to capture my attention – it’s of Lyle in his cracker jack Navy uniform, holding me as a newborn in 1944. We were always aware of what was going on with Lyle through letters and cards. That method of communications, however, doesn’t convey the true depth of ones impact on the community and the family surrounding him. After I joined the Navy I found myself more often in a position to either visit him in California, or at his home here. And, I got to know more about him, learning to love him as a brother instead of a random visitor. He was unselfishly devoted to his family with Ruth which is obvious to all who knew him. In return, they were devoted to him. Respected him. Adored him. He was living a dream with Ruth, Larry, Cheryl, Carol, and Todd. He was a pillar in the community and we are all proud of his accomplishments. We loved him even though he never tired of telling us Oregonians what a “real” hoagie, or a “real” pizza was. When Lyle turned 70 years old we started a tradition of traveling to each brother as they, in turn, turned 70. Lyle and Ruth traveled west for Jim in 2006, and again for Jack in 2008. Sadly, my 70th celebration will be one brother short. I understand, and know that he will be there in spirit as an honored guest. A few days ago I found myself alone, and I sat in the quiet house, in Lyle’s place at the table. Letting my mind wander a bit, which isn’t surprising to most who know me, I could easily envision Lyle puttering around in the kitchen, or calling to me from another room, to relate something of importance. It was comforting, and I knew he was with me. He’s with me now, as he always will be. I’ll miss not being able to hug him, shake his hand, or simply just watch him sleep on the couch. I don’t really recall what I actually said, but many parts of the above were included. I did remember to speak slow, as Jack suggested at our last funeral, and it seemed to work well after I got the mike pointed in the proper direction. When I was done, I introduced Larry who had written many things about why he loved Lyle. It was very moving, and I’m happy he went 2nd because I could never have equalled him. Then Susan sang another song and it was amazing not only because of her voice, but because the bulk of her family were sitting in the pews crying while she stood strong throughout. She held herself together to the end and we were all proud of her strength. Lyle was then wheeled from the church for the final time, followed by Ruth and me, and the rest of the family. I haven’t yet mentioned that I felt overly honored to have been given the honor of leading everyone with Ruth but, then, it may have just been an age thing. Still, I was humbled. After sliding Lyle into the hearse, the pall bearers melted into the crowd and we entered our vehicle for the trip to the cemetery. Again, it wasn’t a long trip, just a couple of miles maybe. When we got there, the pilot van drove all the way past the cemetery to the last entrance which caused Larry and Ruth to question the logic since Lyle’s plot was straight down from the first entry road. This led to a brief discussion that concluded with the belief it was done in order to allow the fifty or so vehicles behind us to line up within the confines of the cemetery roads, and not be strung out down the street. When the hearse stopped well short of the anticipated location, things got interesting. Larry rolled down his window when Michael, the funeral guy, approached our vehicle and reported that Lyle’s vault had been delivered, and placed into the wrong plot. But, the chairs were all lined up, everyone was exiting their vehicles so it was agreed that Father O’Grady would just do the final portion of the service right there, at someone else’s grave site. There was no hurry, because we understood the new occupant wasn’t scheduled to arrive until Saturday. Lyle was removed from the hearse and carted down to the wrong grave and the service proceeded. I didn’t sit, though I could have. Instead, I wandered around the crowd taking pictures. It was great, and we all agreed that this was just Lyle’s way of having the last laugh. Father O’Grady, however, felt it was just Lyle’s way of getting a plot without having to pay for it. We left and drove to the La Notta restaurant in East Windsor where Lyle and Ruth took Diane and me for dinner the evening we drove our marathon around the NE states in 2010. Again, I took lots of pictures of everyone eating really good food. The younger kids had a great time running around on the dance floor, dodging people who were getting food from the buffet line which was parked in the middle of it. Then, it was done. It was finally over, and everyone started leaving. One of Ruth’s brothers, Alan I believe, had been talking to me for a while, then said you need to come out and see my ride. I did and discovered he was driving a 1982 Porsche Targa. Nifty little rig. We chatted a little longer, then he stretched its legs leaving the parking lot to show me what it’s like to be 18 again. We went back to the house for a while, then Susan, Jay, Sarah, and Laura left, leaving us with Martin and Carol. We visited for a while, then they, too, departed. By this time it was almost time for supper, so we decided to taste test some of the dishes that had been delivered over the past week. A couple of them got tossed, then we discovered a meat pie that looked possible, so I stuck it in the oven. About then, Ruth’s neighbor came a knocking, and visited for a really long time. I sat there and listened to them laugh and reminisce about growing up in the Windsor area. It was like having someone read a book to me. About half way through the visit I turned the oven off, figuring the meat pie was about as hot as it needed to be. And, I was correct. After the neighbor departed, Larry and Valerie showed up and we all took a stab at the meat pie. It was interesting, but not something anyone would want to eat a lot of. About the food … though I know it’s not true, I speculated that those who delivered it used recipes they’ve had for a long time but were afraid to try, or they have these recipes they save exclusively for making dishes which they deliver to folks in mourning. I believe it could be a way to speed up the healing process because it makes one want to opt for better fare. Having said that, I must admit that all of the desserts delivered were exceptionally tasty. I know that for a fact. After we all had a couple bites of meat pie, we looked at each other, dropped our forks, and headed out the door for Chili’s. It was a very good end to the day. Oh, ya, we went back to the cemetery, too, to make sure Lyle was in his proper place. He was and I can prove it because I took pictures. Now, to put a few things in perspective for you. 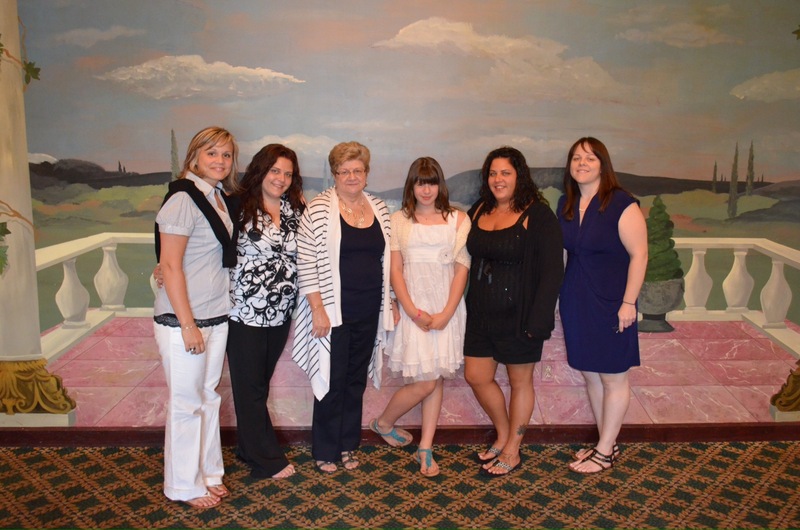 Following is a picture of Sarah, Laura, Ruth, Alicia, Heather, and Susan. That’s the order they’re standing in. On Saturday we’re going to Saratoga Springs, NY to attend Heather’s and Justin’s wedding. We’ll be staying over Saturday night, returning Sunday. As luck would have it, Ruth and I are sharing a room so I’m pretty excited about all the rumors we can start with this trip. I’ve never been to a wake before so today was a real eye opener for me. Sure, I’ve viewed deceased family members, and others, but I’ve never experienced an event like this. Ruth told me she insisted on the wake because it’s a good way to get closure. I have to admit that I was extremely skeptical with Lyle laying right there where he could hear every word. I half expected him to raise up and ask everyone to keep the noise down because he was trying to sleep. But he didn’t. He didn’t even flinch. The wake was scheduled for four hours. For those of you who may never have experienced a wake, it’s a period of time used to punish close family members by making them stand in a line, for the entire period, while pretty much everyone in the entire town files by to pay their respects. Really, the entire town. There were at least half a bazillion of them. Honest. I didn’t know there were than many people in Windsor Locks. Michael, the funeral director said it was “a good turn out,” which reminded me that folks from Suffield were there, and a state representative showed, up, too. That explained it. Since I was part of the family, Ruth put me at the head of the receiving line so she could introduce me to everyone. At first I didn’t think that was right, but I was, after all, there for her. So, I quit my belly aching and stood my watch. I shook hands with everyone, hugged those I remembered from our 2010 trip, and grew accustomed to everyone extolling the saintly status of my brother. Normally when I hear the same words repeated over, and over, I grow deaf to them, but that didn’t happen this afternoon. I always knew Lyle was a stand-up guy, someone to admire, and a good person to call friend. Listening to everyone repeat this to me over that four hour period made me realize that there were many sides of Lyle I didn’t know at all. That’s understandable, because these people were pretty much a daily part of his life while I, and Jim and Jack, though more closely bound by blood, we missed a lot because we didn’t have that personal connection. Toward the end of the scheduled 4-hour period I realized that it was OK Lyle was laying there in his casket while everyone shared stories, passed their condolences, and reiterated what a great guy Lyle was. I became so comfortable with his silent presence that I almost waved at him a couple of times. But I didn’t. By that time I knew he wouldn’t wave back, and I understood the healing benefits of a wake. We were becoming desensitized to his presence, making it easier for all of us to take that next step forward. To let the din of daily life creep back into our sensory range knowing that all is well. All is as it should be. Now we all, even Lyle, can move on to the next phase of existence. In summary, I was devastated when we first got there, not prepared for the emotional response that erupted when I first saw him laying there. It was like a time warp in my head because the last image I had of him was standing beside Ruth in the open door of their garage, waving goodbye when Diane and I headed home from our visit in 2010. Then, BOOM, there he was, prone and silent. Prone was familiar, silent not so much. By the end of the evening a billowing sense of calm pervaded the room, and everything seemed to be OK.
After that we all went back to Ruth’s, ate pizza, and continued with the stories until it was time for sleep. Tomorrow is the funeral and I’ve been blessed as one of the eulogy guys. That seems to be a developing theme for funerals and me lately. Hello everyone. I want to thank those of your who held my brother Lyle in your hearts, however briefly. He succumbed yesterday to a very aggressive lymphoma B cancer about three days after it was diagnosed. 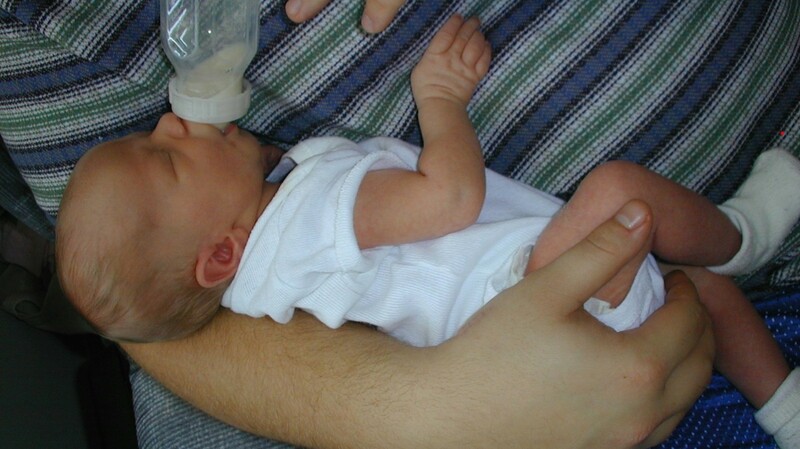 He was in a great deal of pain and there wasn’t anything the doctors could do except make him comfortable. It was fortuitous that Lyle & Ruth’s granddaughter, Sarah, is an RN at the hospital where he was, and he had first class care. For that, we’re grateful. He will be missed. Especially all those emails he signed with “older and wiser big bro”. As I write this I’m on Delta flight 1156, headed for Atlanta. From there I’ll continue on to Bradley Field in Hartford. I’m in the middle seat near the rear of the plane. To my left is Lionel who lives in Lake Oswego. His son is a redshirt freshman Oregon Duck, #33, outside linebacker. To my right is Don who lives in Firlock Park in St. Helens. Don works at Boise Cascade and knew Diane’s dad, Mel. He also knows Diane’s uncle Bill and aunt Carolyn. Small world. So far all I’ve spilled is a glass of orange juice. Most of it went in my hat, and all over my tray. Sadly, doing this triggered a strong desire to verify the functionality of my urinary tract. I know it was working before we took off. But, I’ll need to check it again before i can safely take a nap, which I need. The nap would be good because by the time Diane and I made these travel plans it was after midnight and we needed to be out of the house by 4:30 for my 6:20 flight. I did not sleep at all. I hope everyone is well. Except for my inflated bladder and my sore hip I’m fine. Oh, my eyes burn, too. Howdy All – It’s been pointed out to me, by an unbiased relative, that three days have passed since my last entry, and I suspect everyone is just chomping at the bit to know if we made it home without something breaking on the old RV. Or, maybe most of you are secretly enjoying a respite from my assault on your eyes and imagination. Maybe a little of both. In case you’re in the first group, we did make it home with only one minor issue. When we stopped for a rest in Hood River our brakes made a horrible noise. It sounded just like a power steering pump that’s low on fluid. So, I added some to the power steering pump and it stopped. Ya, I know. How does that work? All I can tell you is that the power steering unit has hoses going back to something that looks like it might have something to do with something other than steering, so it must be a hydraulic-type secondary for the brakes. Terry knew what it was but I as baffled that there was an association between steering and brakes. Who knew? Now that we’re home, and I’ve downloaded all my photos to the computer, I can share some of them. Once I did that I actually paid attention to what was going on and discovered that I’ve got almost 72,000 pictures on my hard drive. I’m thinking it’s about time to burn some of those to a DVD, or something, before the computer crashes and I lose them. For the trip, you already know we did some work on the RV so we wouldn’t be embarrassed at our destination. Turns out that wasn’t an issue because all the owners of the huge rigs, with all those slide outs, were happy to see us and we even had to host a visitation period for them. It was surprising how many of them came over. After a scrumptious PB&J sandwich, made by my favorite cook, we continued our trip east, finally turning north somewhere east of Boardman. The goal was Kennewick. It was a brutal trip, 91+ in the shade, and there wasn’t any shade. We lost numerous pounds even though we had our windows open. It was hot, and I didn’t think we’d ever stop, but we did. We got there right about supper time, parking in the Kennewick Elks Club parking lot. No hookups. Just a parking lot. But, it didn’t cost anything. 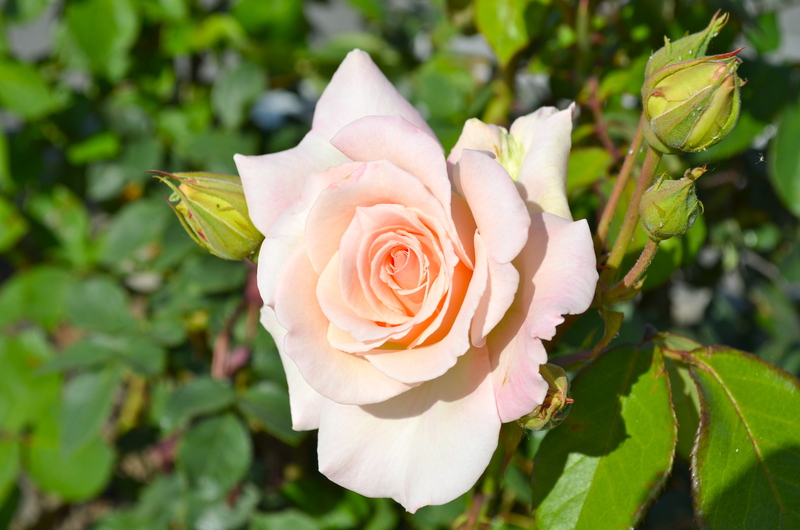 We were allowed to sit in the shade in the little patch of grass next to the lodge, and sniff the one rose that was blooming there. 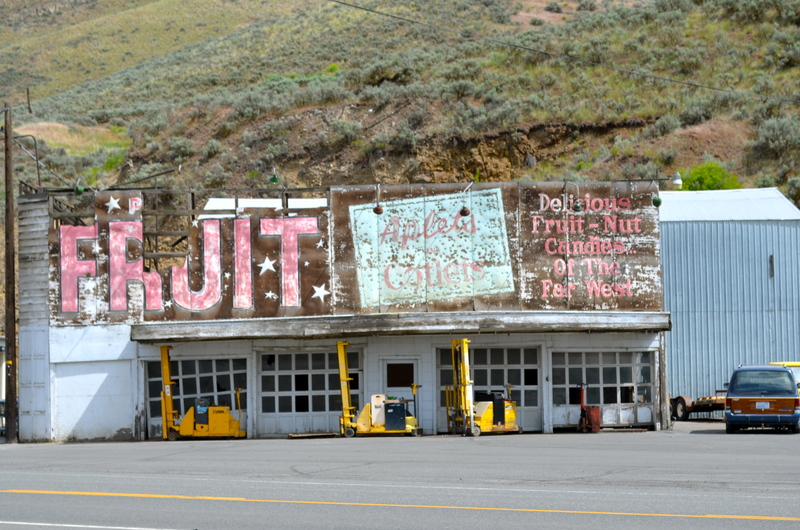 After a long hot night, we continued our trip north to Moses Lake, arriving in the town about noon. Seems like we always managed to stop just about the time to eat a meal. The first stop was the Moses Lake Dollar Tree where we parked in the shade while some people went shopping. Truth is, we were waiting until 1pm when Jeff was supposed to arrive at the fair grounds. 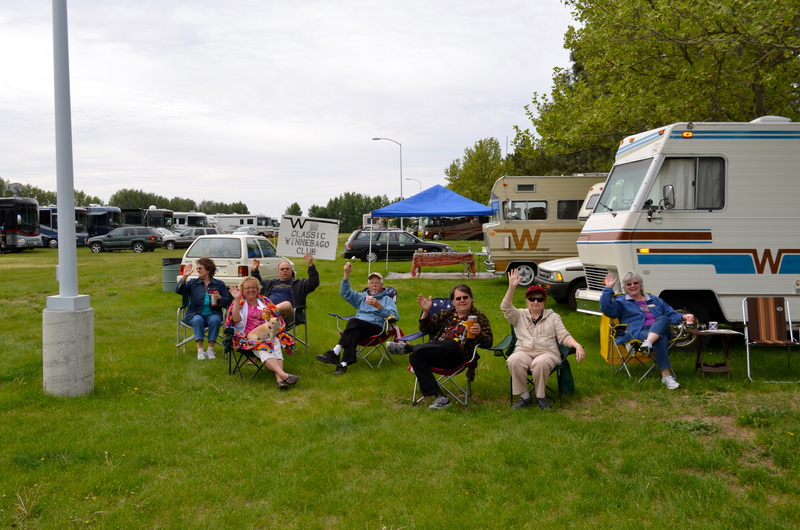 As we drove to the fairgrounds, we found ourselves in a long line of really huge Winnebagos. I may have mention this before. I would have taken a picture, but I’m the only one allowed to drive the RV so couldn’t. It was pretty impressive. When we finally arrived, we were directed to the first 6 spaces just inside the gate. I think we were put there so everyone else driving in could see what they were missing in their big fancy rigs. That’s me, Cliff, Terry, John, Les, and Jeff, who grew an especially flashy mustache for the occasion. Quite impressive. The guy on the right, in the white shirt, was practicing his moon walk. Everything went along quit nicely until Terry found something under his hood the got Les’s interest. I don’t know that anyone ever found out what it was. I rigged up a TV antenna for Diane using my camera tripod. It went nicely with the rest of the decor. We made it home without mishap and all is well. Greetings Humans – today is Sunday, Jerrie’s birthday, and we successfully traversed the treacherous roads between Moses Lake and Yakima. No dents, no dings, and still have gas in the tanks. It was cool enough on the trip that we didn’t have to run the generator for the A/C. It even sprinkled on us a little as we drove. 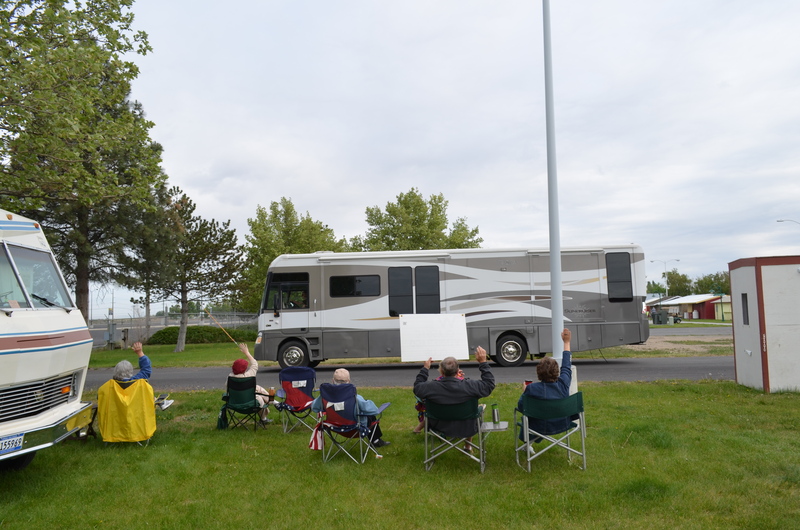 Before we left the fairgrounds, we lined up our chairs along the exit road and waved at all the multi-hundred-thousand-dollar rigs as they left. It was pathetic, but they all left with a smile, and we had a wonderful time. We’re like the poor cousins to this organization, and it’s OK. We can find parts in Wal*Mart to fix ours – they can’t. But, they’re really, really, nice inside. Today’s drive was relatively short. Only about 100 miles. 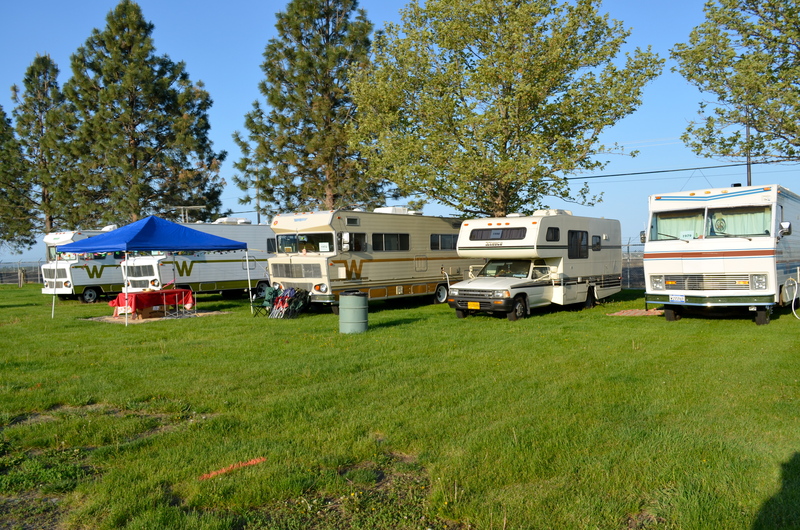 We are currently parked in one of the 30 RV sites at the Yakima Elks Club #318. It’s pretty nice. Has it’s own very large golf course. I suspect it’s a thriving club. After we got all hooked up, we all piled into Susie and Cliff’s rig, which is a Toyota Itasca Spirit, and easy to park. It also gets 16 mpg, which ours don’t. 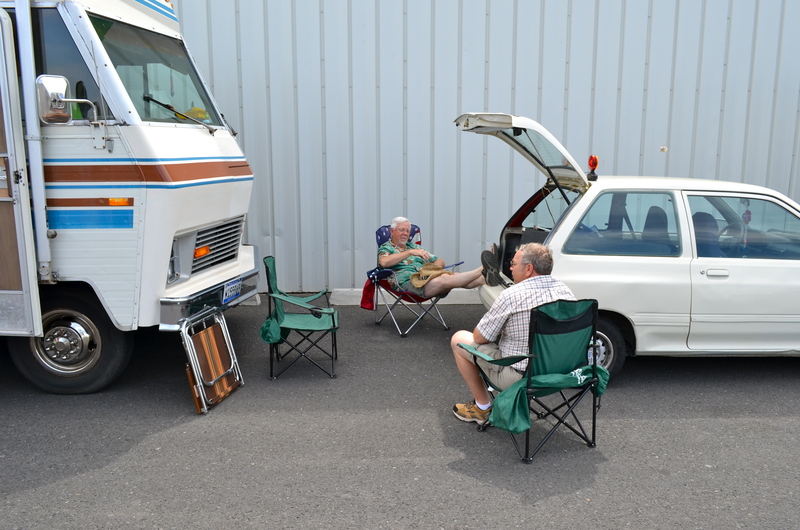 Terry and Carolann have a tow car but it’s a tiny little Ford Festiva, and it’s full of “stuff” that wouldn’t fit in their RV. We went to dinner to celebrate my birthday, which was nice. We ate at Old Country Buffet which was perfect because it has food to fit everyone’s taste. I ate too much, but it was really, really good. I had seven kinds of chicken and a piece BBQ ribs. Didn’t even get any on me. I was very proud. So was Diane. I only have a short time to render a plea for assistance to help us escape from this place. We tried to get away this afternoon, but all we managed to do was get our holding tanks dumped before we were forced back to our designated spot inside the fairground permiter. 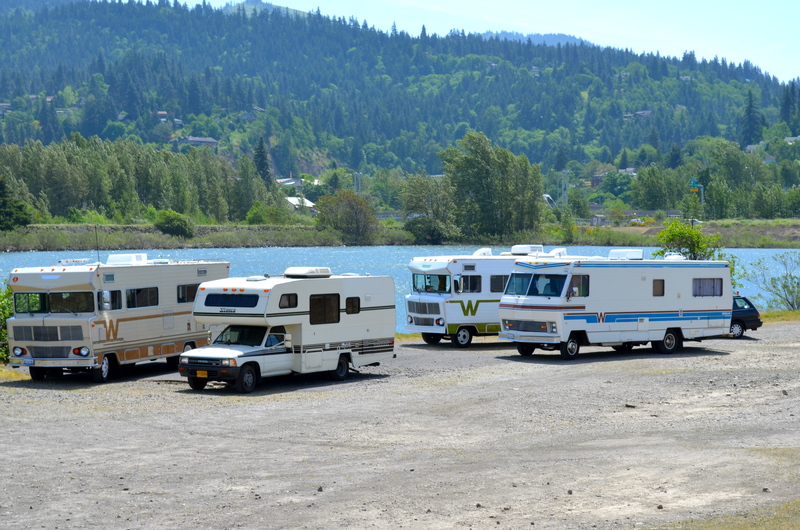 Five days ago we began this adventure when we motored to Troutdale and met up with three other vintage Winnebago/Itasca RV’s which range from 1973 to 1990. Ours, as you may recall, is a 1979. The trip began nicely with a mosey across I-84 where Terry led us to a nice secluded location where we ate a scrumptious PB&J lunch. This location had a peek at the windsurfers on the Columbia, but we hesitated to stay long because the wind was blowing so hard we feared for our safety. After lunch Terry led us on a tortuous journey of about 7 hours to Kennewick, Washington where we holed up in the Elk’s parking lot. The temperature during this grueling drive was around 114 in the shade and we were melting since we do not have dash air in our rig. 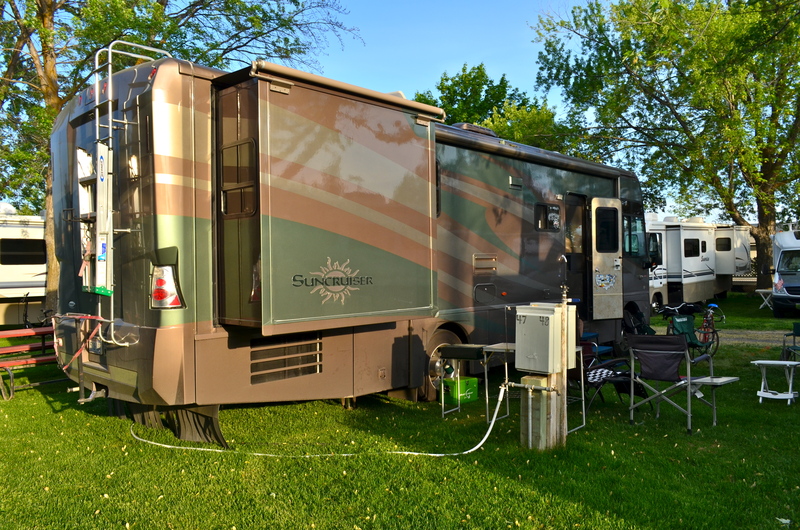 Once parked, we had a chance to set out in a shaded grassy area for a bit, letting the generator run so the roof A/C could cool down the interior of the RV. In doing this I realized that we could have been running it all day long during the heat of the day while bombing down the highway. While all the others went to the Kennewick Mall, and had dinner, Diane and I walked two blocks to McDonald’s and got chicken sandwiches which were very good. I had bacon on mine. When everyone returned, we visited a bit then retired to our respective vehicles. The night was OK, and we were up early enough to get a breakfast sandwich and coffee from Mickie D’s, then we were off again for a short trip of about 89 miles to Moses Lake. No one encountered any difficulties and we made it safely, stopping at the first Dollar Tree we saw. Next to it was a DQ which was good for a chocolate malt for me and a caramel something or other for Diane. We parked in the shade, killing time, so we could arrive at the fairgrounds about the same time as Jeff, who was coming from the Seattle area. 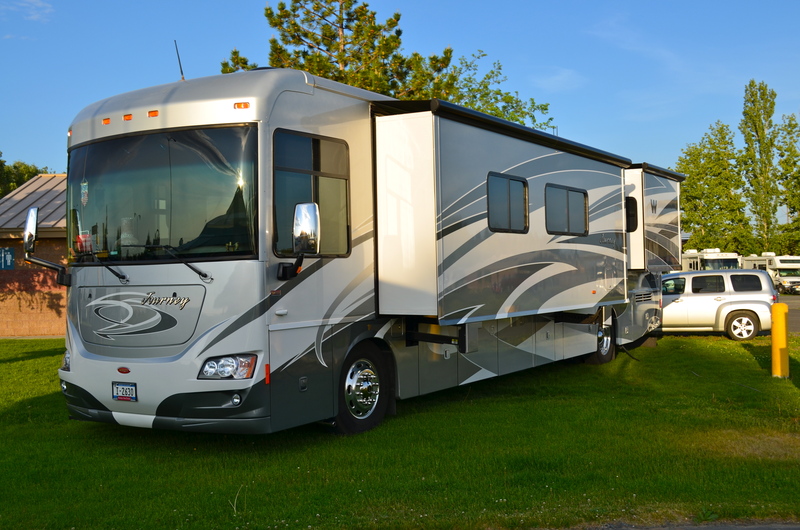 As we traversed the last couple of miles through town to the fairgrounds, we found ourselves sandwiched between dozens of really huge Winnebagos, much newer, and far more expensive, than our little group of four. It was pretty intimidating. Once we made it through security we were directed to our designated spots just inside the gate. As we were parking, Jeff arrived making us a stronger group of five. Still, we were isolated from all the expensive rigs which cost anywhere from $150K – $500K or more so, I believe, we wouldn’t scratch them. The first day we had our own Mexican pot luck for dinner while the expensive RVers spied on us through their fancy blinds, eating surf & turf supplied from town. They do this because they don’t use their kitchens like we do. Our little group had a wonderful time until it was time for me to get the TV going so Diane could watch Dancing With The Stars, or America’s Got Talent – one of those. It took a while to get the antenna pointed right, and at the right altitude. 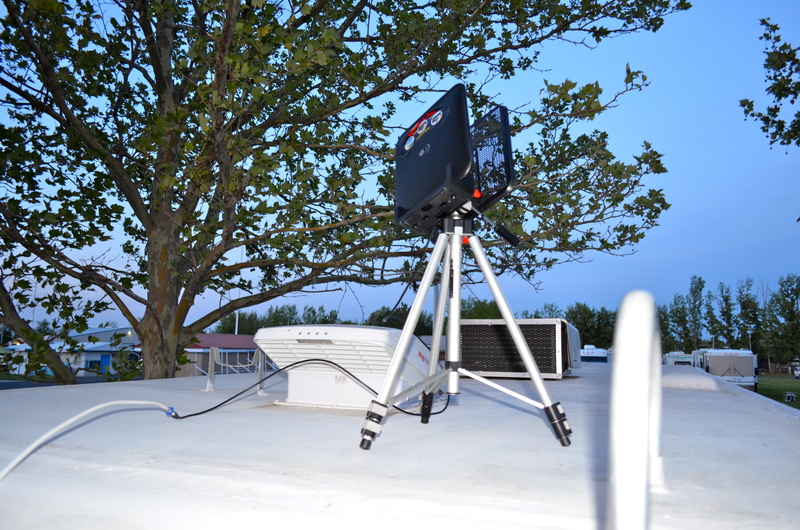 The final solution was achieved by attaching the antenna to my camera tripod, and attaching that to the ladder on the roof. Tricky. A real redneck setup, but it worked. We slept well that night. I think it was a Thursday. Friday, John & Sue showed up with their 1970 unit making us a stronger group of six. We ate the remainder of our Thursday evening potluck for Friday lunch. It was a hot day, but cooled off nicely when the breeze kicked up to around 87 mph. John was happy because he had a kite to fly and it worked well. Friday night, last night, we were fed more Mexican food, and were entertained by the Winatchee High School Mariachi Band. They, and their teacher, were just awesome. A great group of talented kids. It was a real treat. Then we slept. Got up, got coffee, ate tacos for lunch, and tacos for dinner. It was brutal. Everywhere you looked it was Mexican food, Mexican food, Mexican food … Somewhere in there our group was forced to serve the food as people passed by with their plates. I was the left line “Meat Guy” … Jeff was the right line “Meat Guy”. 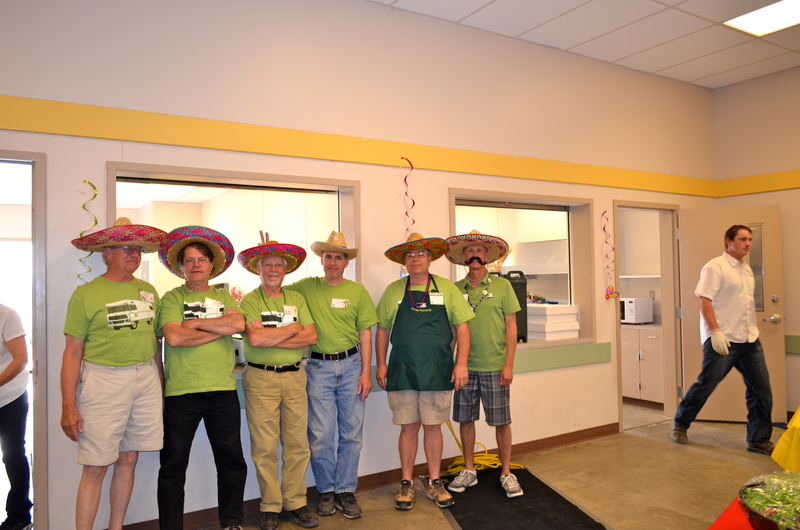 We had a lot of fun and provided proper portions, ensuring there was enough for everyone, unlike the “Soup Guys” who ran out about halfway through the line. It was horrible. We thought there would be a terrible mob scene clamoring for their soup, but it didn’t happen. It turns out that by serving old people, those who didn’t get soup apparently weren’t aware that there was soup so it was a non-event. 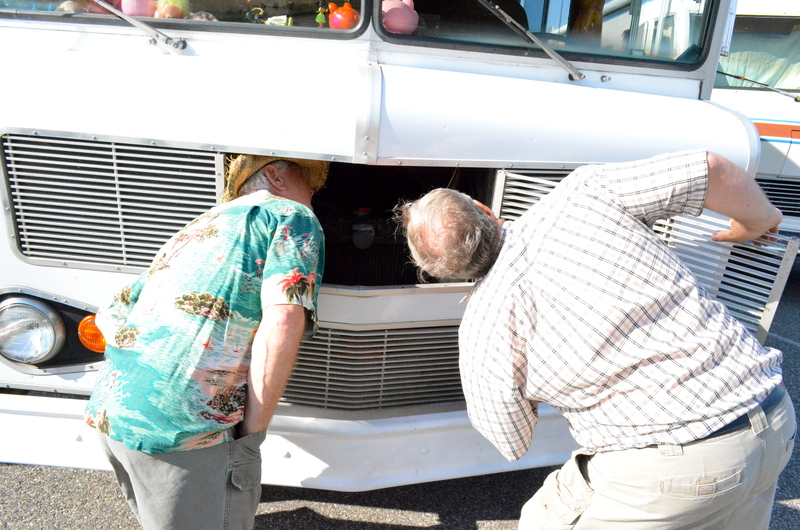 Yesterday the hoyfaloye Winnebagoers came by to tour our pitiful little rigs and were really interested in how they’ve been fixed up, or not. Most of them used to have rigs like ours but have since moves up to the hugs ones with computers, and TVs. It was interesting to visit with them. Today it was more of the same for lunch, but for dinner they lured us into the dining hall, conveniently located about 100 feet from where we were forced to park, with a BBQ pulled pork and chicken dinner. It was truly awesome, and we didn’t have to bring our own plates! It was all very delicious. After dinner we were forced to sit there through various forms of entertainment, raffle drawings, and various give aways, during which our table of six RV’s won four of the door prizes. Getting to the end, the 50-50 drawing, took almost 2 hours. We were dying in there, but had to stick around to see if any of our group won. They didn’t. Finally we were released to go “home”. Jeff at 0800. We don’t know when we’ll be leaving yet because we haven’t received clearance from the organizers. We plan to make our escape and make it at least to Yakima tomorrow, then head across Highway 12 to I-5. So, if you don’t hear from us for another couple days, send help. We’re probably stopped somewhere along that road where there’s no cell service.